For the past weeks and months I had worked on making a huge dream of mine come true. I wanted to work in a big photography studio in the U.S. About a week ago from today, I received the news that this dream, that I had worked so hard on, would not come true. These news really catched me off guard, and threw me off course. I was convinced that it simply had to come true with all the passion I had invested, but sometimes life simply doesnt work that way. However, after two days full of thinking about how to continue from this point, i made the decision to use the time and money that I had worked so long for, for something special. I always felt attracted by Asia, but either I did not have enough money, or enough time on my hands to really do it. Now, in this situation, I do have both and no more excuses. I will go to Asia! From the first moment on, I knew where I wanted to start such a trip: Thailand. To be honest, I don’t know too much about the differences of all the asian countries, but I have heard so many good stories about Thailand, especially about its reputation for being a very good countryto get your first asia backpacking experiences. So, to make a long story short: I have already booked my flight. I will leave Berlin on Saturday, June 01 and fly via Oslo to Bangkok. Finding a flight within the next two months that would still be affordable was not the easiest task, and it required me to make some compromises. I will fly with Norwegian, which is a scandinavian discount airline that is just getting into the business of long-haul flights. The word “discount” does not necessarily mean that they were too cheap, in fact they were the cheapest but still not cheap. However, the services that are included in the airfare are close to nothing. No check-in baggage (which I am used to, same with many other airlines), no food (true for most short flights, but on a long haul flight???) and most importantly: No drinks. This is something that really got me reconsidering the decision of booking Norwegian. I will fly a total of 15 hours, and not drinking is not only close to impossible, it can also be quite dangerous for your health. Airplane air condition really dries you up, and I remember reading tips of a doctor once who stated that you should drink at least 200ml per hour of flying. I mean, of course you can buy overpriced drinks onboard, but, in order to fulfill these 200ml you will most certainly be bankrupt by the time of arrival. However, I will simply prepare some sandwhiches for the flight, and buy 1 or 2 bottles of water in the security area of the airport. This will solve this issue and still let me survive. Oh, for everyone who is interested, I paid a total of around € 440,- on the ONEWAY flight. I only booked oneway as I plan to explore much more than only Thailand, and so I do not know where I want to fly back from. Booking oneway gives me the freedom of travelling to whereever I feel like, without being bound to Thailand. As I am arriving in Thailand with a oneway flight, I am required to apply for a VISA in advance to arrival. If you are travelling to Thailand with a return ticket, you will get a 30 day VISA on arrival at the airport, if you cannot present a return flight, you will not be allowed to enter the country. 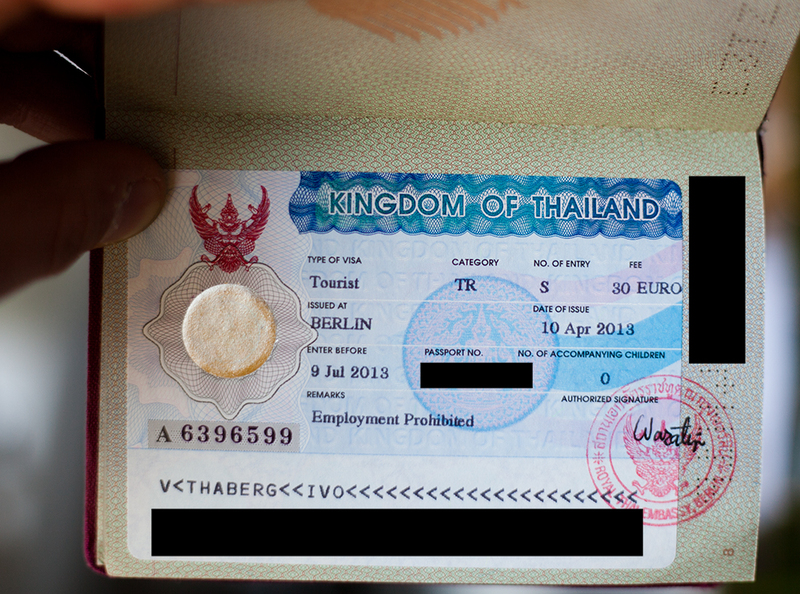 So, in order to acquire my 60 day Tourist VISA I needed to visit the Thailand Embassy in Berlin, with several documents in my pockets. another ticket to proof that you are leaving the country within 60 days. This might be a plane, train or bus ticket. In my case, I simply booked a bus ride from Thailand to Malaysia through Sri Maju. This was the cheapest way of getting my hands on a paper that proofs that I am leaving in time. I could have also booked a train ride or flight, but both would have been a lot more expensive. Also, this company was one of the only ones I found that offered online booking. Most bus companies are only selling tickets on spot, without any reservation in advance or such thing. No I have to wait for about 7 days to pick up my passport, hopefully the VISA will be in it! I am planning to document my whole trip in fine detail, so come back very soon to receive your update. After a week of waiting, I finally got my 60 day Tourist VISA. It starts getting real.